You are here: Home / Controltrends News / Automated Buildings / Ken Sinclair’s Automated Buildings’ September, 2018 Issue, “Building Better Bots Mindful and Open.” Self-learning Machine Vision Rising to Best of Edge Bot Breed! 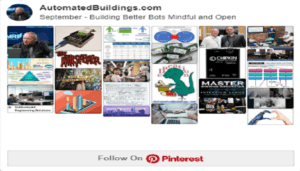 Ken Sinclair’s Automated Buildings’ September, 2018 Issue, “Building Better Bots Mindful and Open.” Self-learning Machine Vision Rising to Best of Edge Bot Breed! In his September edition of Automated Buildings, Ken Sinclair concludes that “the most important component of the open movement is opening our minds while growing younger.” Ken also cites Self-learning Machine Vision as the newest and most cost-effective Edge Bot Capability yet. Read more! Excerpt from Ken’s September editorial: “While whispering, I shouted these words: Those that well understand what I am talking about are younger, we all need to grow younger to understand. We all need to engage with their digitally raised thoughts to help us understand new ways of thinking and doing old things. The complete industry needs to grow younger while engaging in the discussion of digital disruption.” Read more! Elevating Smart Building Design to Create Attractive Spaces, Brad White, SES Consulting Inc.